adidas Originals has teamed up with British footwear brand size? for a special edition footwear design to celebrate St Patrick’s Day. 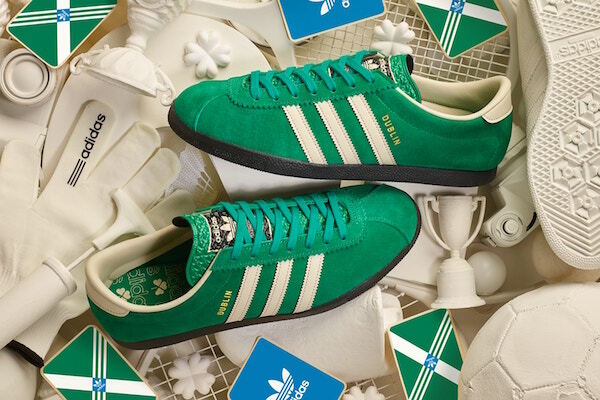 The ‘Dublin’ shoe model comes dressed in emerald suede with adidas’ iconic three-stripes logo in white leather. It carries a black sole and gold foil branding with a shamrock graphic on the insoles. The shoes will be available on 17 March exclusively via the size? website. Adidas isn’t the only brand executing something special for this cultural and religious event on 17 March 2018. Krispy Kreme is serving up green donuts in honor of the Feast of Saint Patrick as well.